Plus que 3 journées de combats avant la fin du tournoi, et les choses commencent à se décanter sérieusement. Par contre, le groupe de tête est toujours mené par le yokozuna Hakuhô, suivi comme son ombre par le géant Ichinojo. Pour le yokozuna mongol, qui affrontait l’ôzeki géorgien Tochinoshin, ce ne fut pas une partie de plaisir. La séance a tourné dès le départ au corps à corps, chaque lutteur mettant toute sa force et son poids pour déséquilibrer son adversaire. Pourtant et malgré l’impressionnante musculature de Tochinoshin, c’est bien le mongol qui a réussi progressivement à écarter le géorgien. 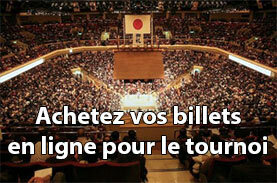 Hakuhô reste invaincu, mais Tochinoshin stagne à 6 victoires, lui qui a besoin des 8 victoires pour ne pas être démis. Tout de suite derrière, Ichinojo retrouvait le maegashira 8 Asanoyama, bien classé avec 7 victoires. 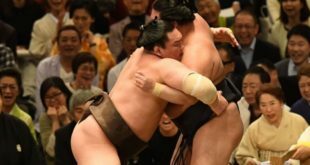 Le maegashira 4 a dominé de la tête et des épaules son adversaire avant de le projeter à terre. Le mongol garde sa deuxième place. 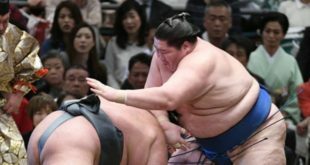 OSAKA – Yokozuna Hakuho defeated ozeki Tochinoshin on Wednesday to retain his lead at the Spring Grand Sumo Tournament with 12 straight wins. 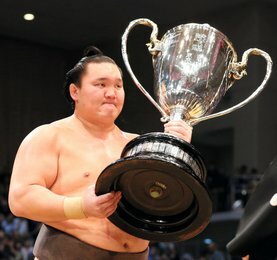 Hakuho faced little challenge from the struggling Tochinoshin (6-6), who has only beaten the 41-time top-division champion once in 28 matchups. Hakuho hemmed up Tochinoshin after a momentary stalemate, then turned on the gas after recharging his engine and deposited the ozeki over the straw. Fighting as a demotion-threatened kadoban ozeki, Tochinoshin needs to secure two wins over the final three days of the 15-day meet to retain his post at the sport’s second highest rank. 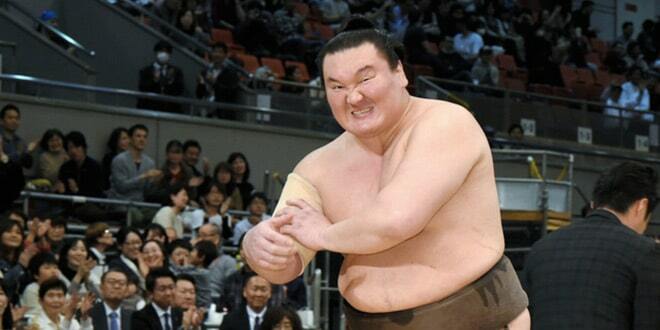 The day’s final bout at Edion Arena Osaka was an upset, with ozeki Takayasu (10-2) defeating yokozuna Kakuryu (9-3). With both wrestlers looking for their 10th win, Kakuryu fought back to gain the inside edge against the ozeki and planted himself in the center of the ring. 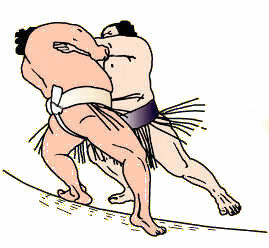 But Takayasu found the yokozuna’s belt, and hefted Kakuryu over the edge before falling out himself. 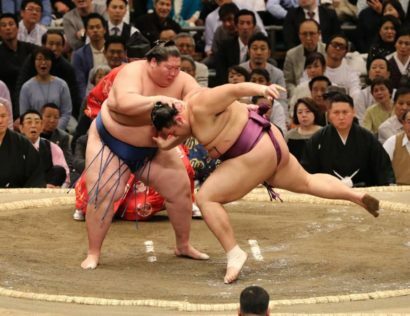 Takayasu improved to 9-12 in his rivalry with Kakuryu. 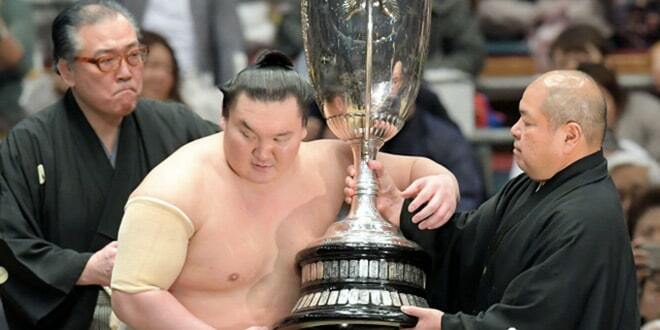 Rank-and-filer Ichinojo (11-1) remained the only wrestler one win behind Hakuho after defeating No. 8 Asanoyama (7-5). The No. 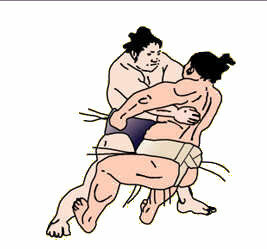 4 maegashira promptly secured a left-handed grip on Asanoyama’s belt as the wrestlers collided, then swung the 170-kg wrestler around to the edge of the ring. 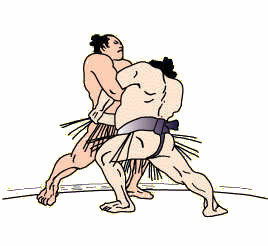 With his opponent backed into a corner, the massive Mongolian swung his right arm over Asanoyama’s head for extra leverage and threw him down to the clay. 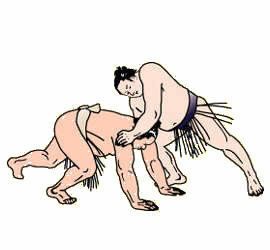 The sekiwake wrestlers, who won titles at the previous two tournaments, had mixed fates on Day 12. 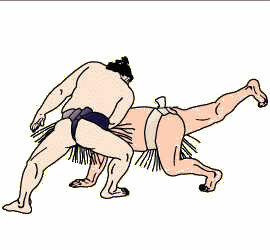 Takakeisho (8-4) suffered his second straight loss in his bid for a promotion, this time at the hands of Goeido (10-2). 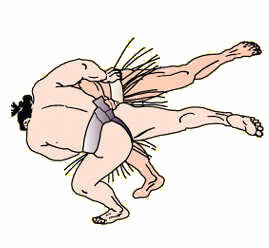 The ozeki put Takakeisho into offensive mode with some hard shoves, then routinely slapped him down as Takakeisho tried to answer back. 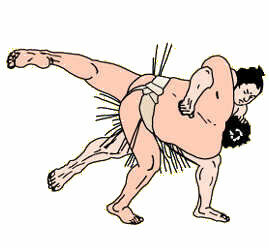 Tamawashi (5-7), meanwhile, defeated top-ranked maegashira Endo (4-8). After a heated exchange of slaps, Tamawashi was driven to the edge but reversed on the straw and dashed out of harm’s way. The Mongolian turned and put everything into a flying shove to launch Endo off the raised ring. Among the komusubi, Mitakeumi fell to 5-7 with a loss against No. 2 Myogiryu (5-7). 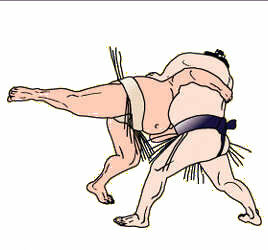 Mitakeumi staved off several throat holds and tried to maneuver Myogiryu to the edge, but was shoved out in the process. Newly promoted Hokutofuji (4-8) bounced back after posting a losing record on Day 11 by taking down No. 3 Nishikigi (3-9). Hokutofuji created some distance with a hard initial shove, then bulldozed the maegashira out.